If you have not play Defense Grid yet, shame on you. It is a good game. Since its 2009 release, Hidden Path Entertainment has been continually offering new DLC to the core experience, adding new missions and challenge maps. You Monster, an optional $5 expansion available for both XBLA and Steam, is directly linked to Portal, Valve’s cult hit, and offers a uniquely challenging and fan-favorite experience. Chances are you are a Defensive Grid expert if you are still playing this game. This is good news for You Monster downloaders because it offers new gameplay twists and challenges not found in the original story line. GLaDOS, the ominous AI from Portal, narrates most of the DLC with her witty one-liners and haunting tone. In total, there are 8 new maps, 35 challenge missions, a bunch of new Achievements, and can offer over a dozen hours of gameplay. Visually, new environments also support the Portal theme. GLaDOS is responsible for putting new rules into play. For example, one level plays in typical fashion – aliens enter from the entrance and exit from the exit. But about half way through the alien onslaught, GLaDOS opens a new and unforeseen path which will most likely send in an unchallenged alien swarm. This unexpected turn of events will blindside the player, forcing a quick reaction to prevent seeing the game over screen. The first time you play this stage, this radical change of events almost seems unfair. But the lesson will be quickly learned and compensated for when you try for the second, third, and fourth + times. Yes, some of these levels are quite tough. In another later stage, the player can only place turrets in sets. So if you want to lay down another gun tower, you will first have to deploy all other types of turrets. Twists like these are unexpected and are often thrown at the player in mid-mission. Veteran players will surely have their brains teased with this DLC. 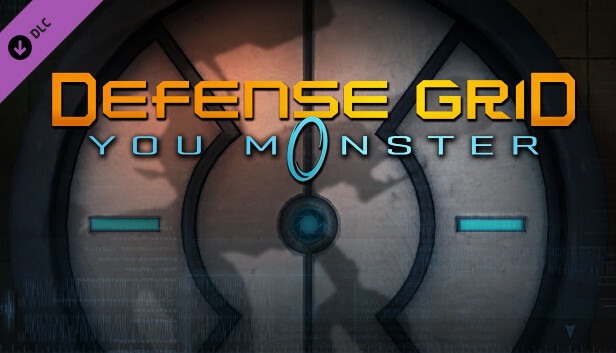 For $5, You Monster will challenge tower defense pros with new creative game design. It would have been nice to see some new alien types or perhaps a new type of tower or two, but each stage’s challenge and Portal references are the major selling points here. Diehard Portal fans should take interest in this DLC just for the unique cross-over alone. I mean, could anyone predict Portal blending with Defense Grid? Who knew?! Also check out the Borderlands and Resurgence DLC.